Dr. Maria Montessori envisioned a society transformed, led by young men and women who experienced childhood in dramatically new and positive ways following the natural laws of biology and psychology - the Planes of Development and the Human Tendencies. In observing children across the globe, Montessori concluded that there are specific and distinct phases of physical and psychological development through which all human beings grow - regardless of cultural context. These planes are biological universals, with predictable timelines and characteristics. 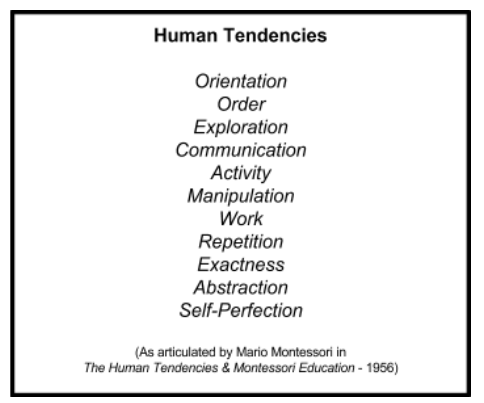 In Dr. Montessori’s view, there are four overlapping planes of human development - each spanning six years - and each marked by an initial three years of creativity and acquisition, and a subsequent three years of refinement and crystallization. The four Planes of Development are: birth to six years of age; six to twelve; twelve to eighteen; and eighteen to twenty-four. Each plane contains very specific developmental tasks that the body and mind are naturally predisposed to satisfy. The four planes highlight the optimal time periods in which these biological milestones are met and consolidated, thereby providing for successful adaptation and independence within the culture in which the child was born. They also serve as the biological foundation upon which we build the mixed-age environments that we create in a Montessori program. 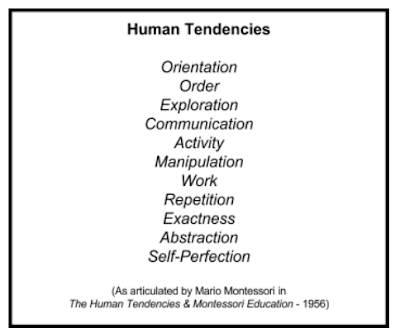 Montessori also recognized that, in addition to the Planes of Development that humans move through as they mature, they are also unconsciously motivated to fulfill specific Human Tendencies: a set of conditions that humans of all ages are psychically predisposed to work to satisfy throughout their lives. The tendencies are basic to all humanity, and manifest differently at each Plane of Development. They are drivers of behavior, and are irrefutable and intrinsic calls to self-actualization. While the Planes of Development are rooted in biology, the Human Tendencies are psychic in nature. They will each manifest in different ways as the child grows. Dr. Montessori believed that the child promises a special gift to the world: that within each resides the tremendous potential and hope for a future imagined and not yet seen. “[T]he whole concept of education changes. It becomes a matter of giving help to the child’s life, to the psychological development of man. No longer is it just an enforced task of retaining our words and ideas. This is the new path on which education has been put; to help the mind in its process of development, to aid its energies and strengthen its many powers. (Montessori, The Absorbent Mind 24). Montessori believed that this new system of education needed to be grounded in a sensorially-rooted understanding of language and math, the physical and natural sciences, and cultural history of the age. As important as these academic ways of knowing are to the child’s development, Dr. Montessori also knew that the development of one’s personality and character, one’s morality and spirituality, and one’s grace and courtesy was equally - if not more - important to the fostering of one’s true independence. “[T]oday, there is a need for more dynamic training of character and the development of a clearer consciousness of social reality.” (Maria Montessori, From Childhood to Adolescence, p. 62). And more: “Therefore a new morality, individual and social, must be our chief consideration in this new world.” (Montessori, From Childhood to Adolescence 73). For Montessori, lessons in Grace & Courtesy - presented initially during the child’s earliest years - are critical to removing barriers to focused engagement and work, as well as to fostering a continually perfecting sense of morality. “Moral education is the source of that spiritual equilibrium on which everything else depends.” (Montessori, From Childhood to Adolescence, 73). Dr. Montessori believed that - taken in concert with the cultural, cosmic lessons of the elementary years, and the adolescents’ work in service of their school and wider community - these standards of behavior are the seeds of peace. “When we let the infant develop, and see him construct from the invisible roots of creation that which is to become the grown man, then we can learn the secrets on which depend our individual and social strength.” (Montessori, The Absorbent Mind 216). Dr. Montessori knew that it was through the wise preparation of the child that humanity could reshape the future as we want it - need it - to be. Nothing could be left to chance. more about the success of his group than of his own personal success.” (Montessori, The Absorbent Mind 212). “Good laws and good government cannot hold the mass of men together and make them act in harmony, unless the individuals themselves are oriented toward something that gives them solidarity and makes them into a group. The masses, in their turn, are more or less strong and active according to the level of development, and of inner stability, of the personalities composing them.” (Montessori, The Absorbent Mind, 215). When we do this, we set the stage for peace. ---. The Absorbent Mind. Amsterdam: Montessori-Pierson Publishing Company, 2014. Association Montessori Internationale. 1966. Print. Standing, E.M.. Maria Montessori: Her Life and Work. New York: Penguin. 1998. Print. Thanks, Fernando, for your interest and kind words! This is big work, made all the more tenable through meaningful collaboration and seasoned conversation. Best, Seth.